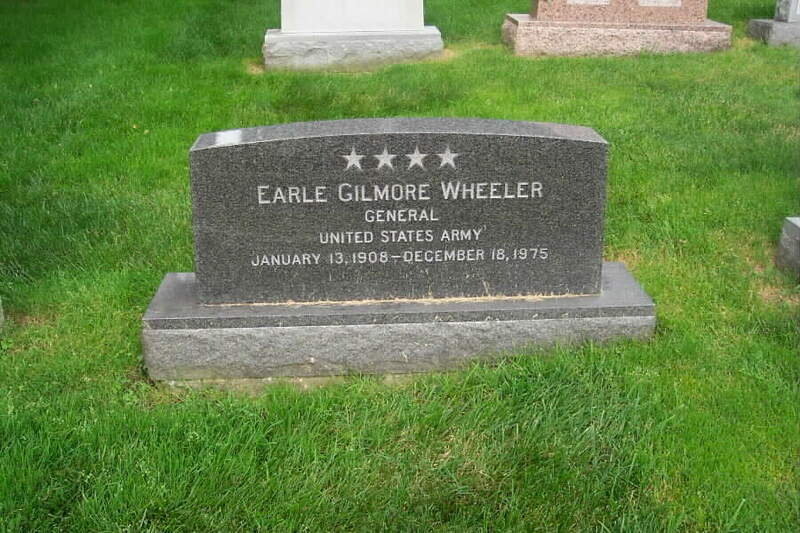 Earle Gilmore "Bus" Wheeler, (January 13, 1908 - December 18, 1975) was a U.S. Army General and Chairman of the Joint Chiefs of Staff. Born in Washington D.C., Wheeler graduated from West Point in 1932 and was commissioned into the infantry. After 4 years at Fort Benning, he went to China with the 15th Infantry Regiment, then accompanied that regiment to Fort Lewis in 1938-1940. He served in a variety of training assignments from 1941-1944, then went to Europe in November 1944 with the 63rd Infantry Division. In late 1945 he returned to the U.S. as an instructor at Fort Sill, then returned to Germany from 1947-1949 as a member of the U.S. Constabulary. He attended and graduated from the National War College in 1950, then returned to Europe in various NATO staff positions until 1955, when he transferred to the General Staff at the Pentagon. He took command of the 2nd Armored Division in 1958 and III Corps in 1959, then became Director of the Joint Staff in 1960. In 1962 he was briefly Deputy Commander of U.S. Forces in Europe before being named Chief of Staff of the United States Army later that year. 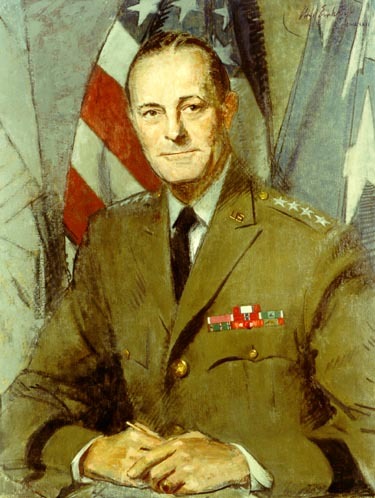 In 1964 he succeeded Maxwell D. Taylor as Chairman of the Joint Chiefs of Staff and held that post until 1970. Wheeler died in Frederick, Maryland after a heart attack, while being transported by ambulance from his West Virginia home to Washington D.C. Considering the large number of general officers available in 1964 with distinguished combat records in World War II and Korea, the staff officer Wheeler was a surprising choice for the top Pentagon post. His relative lack of combat experience, however, might actually have been seen as a plus in the eyes of the new president, Lyndon B. Johnson. The latter was not known for his tolerance of independent thinking, and Wheeler's dutiful acquiesence in Johnson's conduct of the Vietnam War is a failure for which Wheeler has been harshly criticized by some historians. Earle Gilmore Wheeler was born on January 13, 1908 at Washington, D.C., he graduated from West Point in 1932 and was commissioned in the Infantry. After four years at Fort Benning, Georgia, during which he was advanced to First Lieutenant in August 1935, he graduated from the Infantry School in 1937, served at Tientsin, China, with the 15th U.S. Infantry. In 1938-40 he was at Fort Lewis, Washington, with the same regiment, and in 1940-41 was an instructor at West Point, receiving promotion to temporary Captain in 1941 and then graduating from the Command and General Staff School. He was advanced to temporary Major in February and Colonel in November. After various training assignments, mainly in the South, he was sent to Europe in November 1944 as Chief of Staff of the 63rd Infantry Division, which landed at Marseilles, France, and joined Alexander M. Patch's 7th Army. Late in 1945 he returned to the U.S. and for a year was an instructor at the Artillery School, Fort Still, Oklahoma. In 1946, he returned to Europe, and from 1947 to 1949 was on the staff of the U.S. Constabulary (formerly VI Crops) in occupied Germany. He graduated from the National War College in 1950 and was promoted to Brigadier General in November 1952, serving in staff posts with NATO forces in Southern Europe until 1955, when he was attached to the General Staff in Washington, receiving promotion to Major General in November of that year. In October 1958, he took command of the 2nd Armored Division at Fort Hood, Texas, moving up to command also of III Corps in March 1959. In April 1960, he was promoted to temporary Lieutenant General and named Director of the Joint Staff of the Joint Chiefs of Staff. In March 1962, he was promoted to temporary General and made Deputy Commander of U.S. Forces in Europe under Lauris Norstad, and in October of that year he became Chief of Staff of the U.S. Army. In July 1964, he succeeded General Maxwell D. Taylor as Chairman of the Joint Chiefs of Staff. He held that post, through a period of rapid modernization of the Armed Forces during a trying era of war in Vietnam, until he retired in July 1970. In 1973 he revealed that he had, on the personal orders of President Richard M. Nixon, directed secret and, when made public, highly controversial, bombing missions over Cambodia in 1969-70. He died at Frederick, Maryland, December 18, 1975, after a heart attack and while being transported by ambulance from his West Virginia home to Washington, D.C. He had held the Chairmanship oft he Joint Chiefs longer than anyone else. His nickname was "Bus." He is buried in Section 30 of Arlington National Cemetery. Frances Howell "Betty" Wheeler, 90, who was a prominent hostess as the wife of two four-star Army generals, died July 1, 2004, of cancer at a hospital in Martinsburg, West Virginia. She lived on a farm near Martinsburg. Mrs. Wheeler was well known in military and diplomatic circles for many years, particularly from 1964 to 1970, when her husband, General Earle G. Wheeler, was chairman of the Joint Chiefs of Staff. 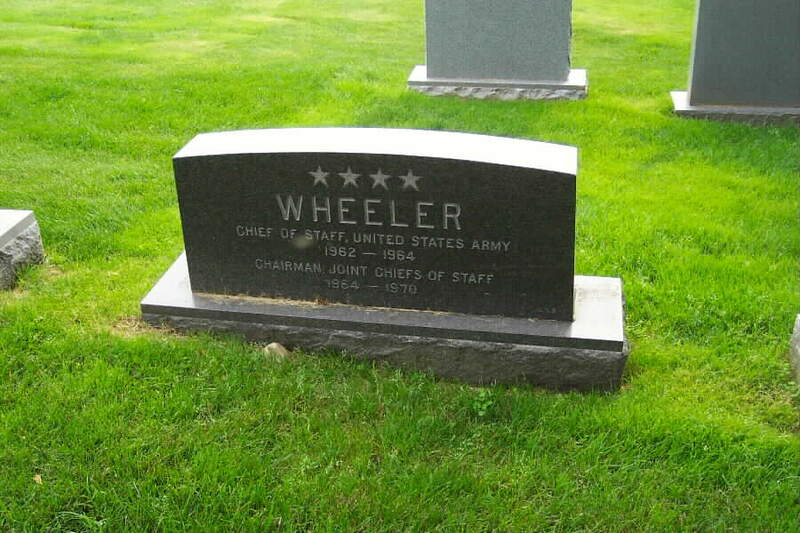 General Wheeler previously was Army Chief of Staff. Mrs. Wheeler, who lived in various military quarters near Washington for many years, christened the nuclear submarine USS Billfish in 1970. She had been married to General Wheeler for 43 years when he died in 1975. In 1980, she married another four-star general, Frank S. Besson Jr., who, like General Wheeler, was a member of the Class of 1932 at the U.S. Military Academy at West Point, New York. Gen. Besson was the founder and first commander of the Army Materiel Command and an authority on military transportation and logistics. They lived in Alexandria until his death in 1985. After General Besson's death, she resumed using the name of her first husband. In 1988, Mrs. Wheeler christened the Army logistical support vessel General Frank S. Besson Jr. Survivors include a son from her first marriage, Dr. Gilmore "Bim" Wheeler; seven stepchildren from her second marriage; three grandchildren; and two great-grandchildren. On July 1, 2004. Beloved widow of General Earle G. Wheeler, former Chairman of the Joint Chiefs of Staff, died in Martinsburg, West Virginia. She is survived by her son, Dr. Gilmore "Bim" Wheeler and his wife, Judy; three grandsons, William G. and John R. Wheeler and Jonathan Aronoff; daughters-in-law, Laura and Jennifer Wheeler; two great-grandchildren, Chelsey and William Wheeler, as well as seven step-children by her second husband, General Frank S. Besson, Jr.
Services will be held on Friday, July 9, 2004 at 2:45 p.m. at the Old Post Chapel at Fort Myer with interment to follow at Arlington National Cemetery. In lieu of flowers, memorial contributions may be made to Army Emergency Relief, 200 Stovall Street, Alexandria, VA 22332.